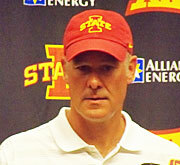 The Iowa State football team wrapped up spring drills over the weekend and coach Paul Rhoads likes the progress his team made. “The growth of this team internally from a competitive standpoint, from a cohesion standpoint, maybe exceeded expectations of where I wanted to get to by April 11th,” Rhoads says. Rhoads says there is still a long ways to go on both sides of the football as he says it’s hard to judge the team by the spring game, because they aren’t allowed to do a lot of things and that makes it hard to find consistent success. The Cyclones open next season at home on September fifth against UNI.